Jeffrey S. Vitter Ph.D. became the 17th chancellor of the University of Mississippi on Jan. 1, 2016 — just in time for the exciting Ole Miss win in the 2016 Sugar Bowl. A renowned computer scientist and academic leader, Vitter previously served for five-and-a-half years as provost, executive vice chancellor and Roy A. Roberts Distinguished Professor at the University of Kansas. Prior to KU, Vitter held leadership roles and was on the faculty in the Department of Computer Science and Engineering at Texas A&M University, Purdue University, Duke University and Brown University. 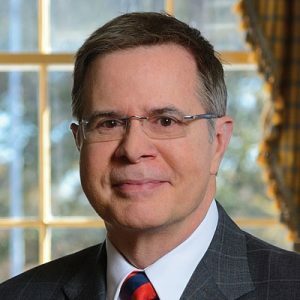 Vitter’s research expertise deals with big data and data science, especially the algorithmic aspects of processing, compressing and communicating massive amounts of information. He has been elected a fellow of the Guggenheim Foundation, the American Association for the Advancement of Science, the Association for Computing Machinery, and the Institute of Electrical and Electronics Engineers. He is a National Science Foundation Presidential Young Investigator, a Fulbright Scholar and an IBM Faculty Development Awardee. A native of New Orleans, Vitter graduated in mathematics with highest honors from the University of Notre Dame in 1977, earned a Ph.D. at Stanford University in 1980 and an MBA in 2002 from Duke University.